Whilst I may not be able to wear much of my wardrobe due to my ever-expanding bump, it's good to take advantage of the nesting instinct and to get mending. 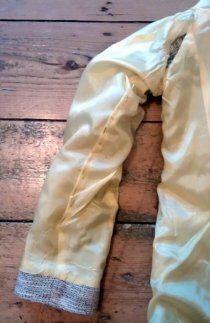 This week in particular is an excellent time to be focusing on repairs as the fashion reuse charity TRAID has declared 17th-23rd November #SecondhandFirst Week. From today until Sunday TRAID and its fashion-forward supporters will be celebrating all things second-hand by asking people to make the #SecondhandFirst pledge, attend one of their events, wear only second-hand or even organise their own clothes swaps and mending workshops. More details below about how to get involved and support TRAID’s campaign. 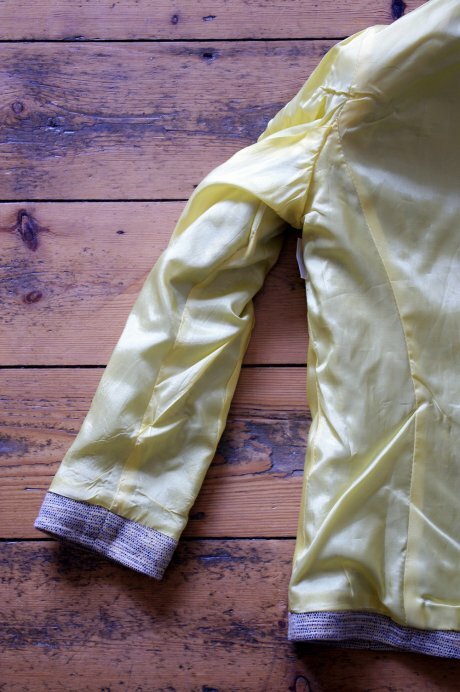 Earlier this year I snapped up a gorgeous 1960s jacket from Oxfam online. It fits like a dream (well, it did pre-baby bump), goes with anything and to top it off, has a charming vintage label – they just don’t make ‘em like they used to! The jacket was in excellent condition when it arrived and after a fair bit of wear from me still looked good as new. But, the lining in one of the sleeves and the armhole came undone – made worse when I put my arm through it before identifying the problem (below left). 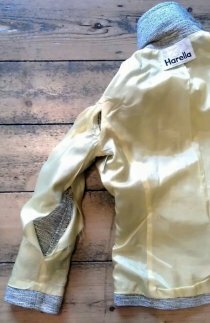 It’s very common for the lining jackets and coats to come undone or to rip, and as always the old motto ‘a stitch in time saves nine’ is one to live by (had I spotted the offending damage before shoving my arm through it, I would have saved myself a fair bit of mending time.) That said, it was quite a simple job as the lining hadn’t ripped. I pinned the lining fabric (above right) ensuring I stayed clear of any frayed edges and carefully stitched it by hand. Good as new...but then, who wants new when they can have #SecondhandFirst! 7) Sign up to TRAID’s newsletter to receive a daily special edition #SecondhandFirstweek newsletter with thoughts, actions, facts and inspiration throughout the week. 9) Organise your own event this week or in the future.